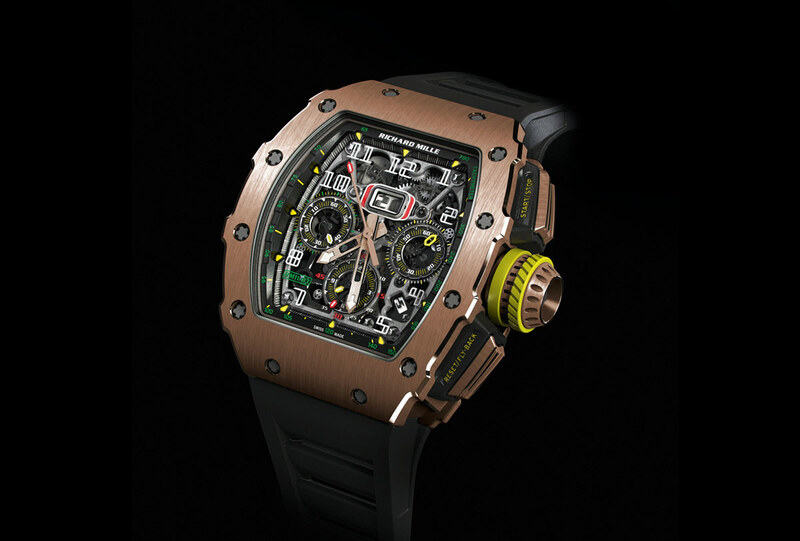 With the new RM 11-03, Richard Mille restyled one of its most successful and iconic creation after ten years since its first introduction. 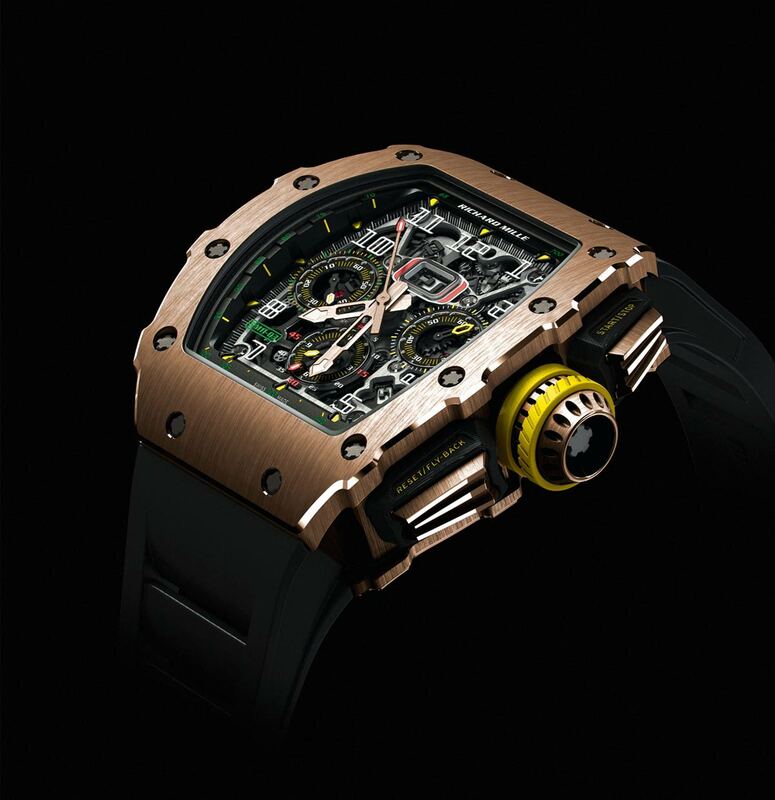 The three-part tonneau case (49.94 mm x 44.50 mm x 16.15 mm) of the RM 11-03 Automatic Flyback Chronograph has been reworked by the designers to lend it an even sportier character. This silhouette first appeared with the RM 27-01 Rafael Nadal to differentiate Richard Mille’s sports watches from lifestyle models. Chamfering and buffing the surfaces is entirely performed by hand. Available in red or white gold and titanium, the case is held together by 20 grade 5 titanium spline screws. 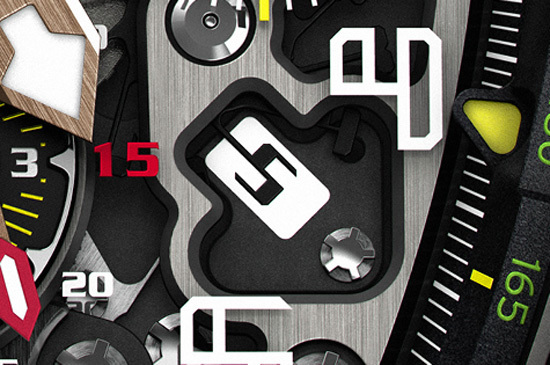 Grade 5 titanium is also used for the crown borrowing the design of competition wheel rims and tyre treads. 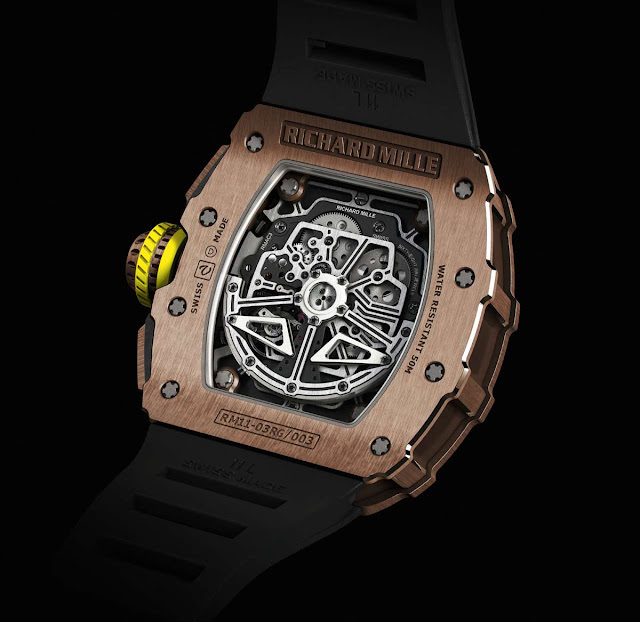 The grooved pushers have covers made of NTPT carbon (to read more about Richard Mille’s innovative materials click here). 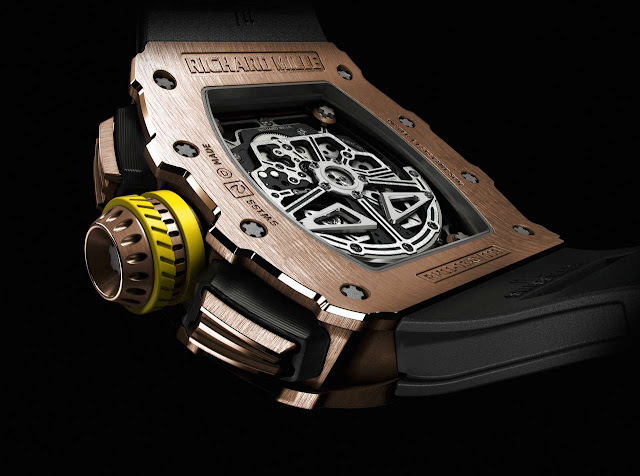 The watch is driven by a movement unlike any other that can be admired on both sides through anti-reflective coated sapphire crystals. 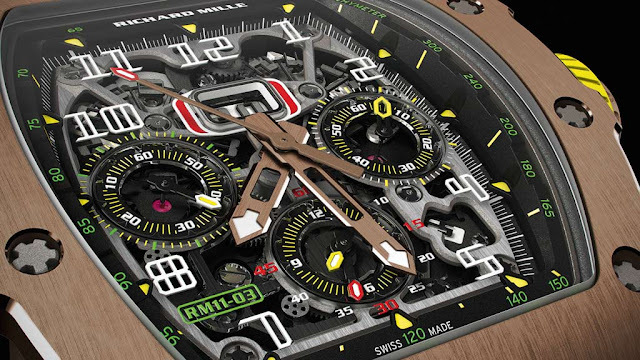 The new automatic RMAC3 calibre emphasises its three-dimensional architecture with glossy bevelled rims around the coloured counters of the flyback chronograph and seconds. The oversize date display of the annual calendar - with automatic adjustment for months of 30 and 31 days - is placed in a red outlined horizontal aperture under 12 o’clock. A small month display is placed between 4 and 5 o’clock. Depth is further accentuated by an upper bridge in satin-brushed grade 5 titanium that contrasts with the movement, also crafted of titanium but with a PVD coating. On the back, a satin-brushed PVD-treated lower bridge highlights the double barrel mechanism ensuring a power reserve of around 55 hours and the modern lines of the variable-geometry rotor in grade 5 titanium. This technical solution makes it possible to adjust automatic winding of the watch to the wearer’s activity level by varying the inertia of the rotor thanks to two microblasted and chamfered wings in white gold. Offering six possible positions, the grade 5 satin-brushed and PVD-treated titanium rotor is mounted on ceramic ball bearings. The 4 Hz (28,800 vph) free sprung balance is highly resistant to shocks and can be tuned more precisely than a traditional balance wheel. I really think this is a masterpiece. Wearing a watch like this must be a dream! I get lost in the depth of the dial- Must be fun to explore it with a macro lens. 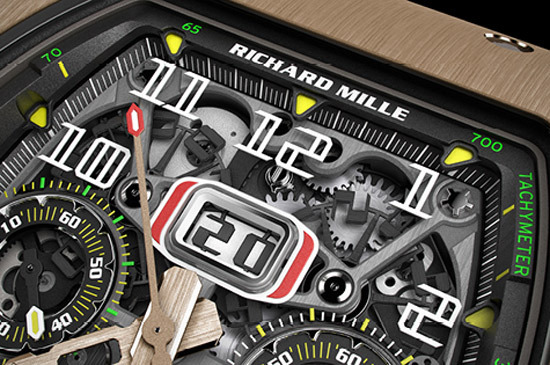 Richard Mille RM 11-03 Automatic Flyback Chronograph. . Richard Mille RM11-03 Automatic Flyback Chronograph. 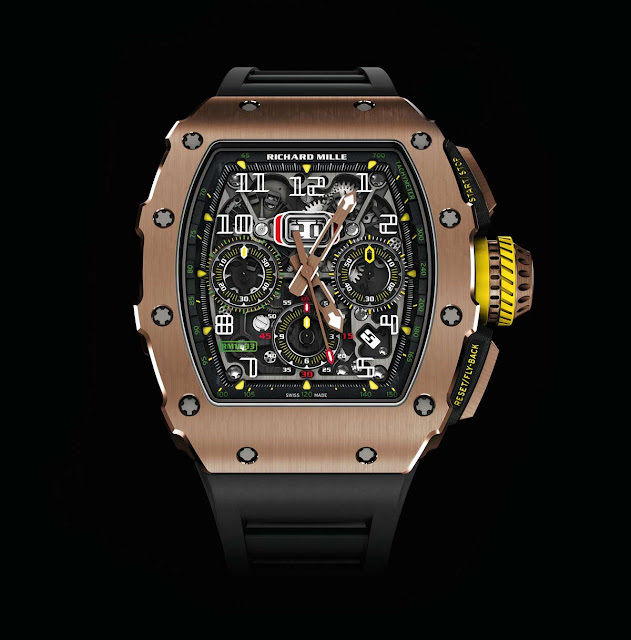 With the new RM11-03, Richard Mille restyled one of its most successful and iconic creation after ten years since its first introduction. 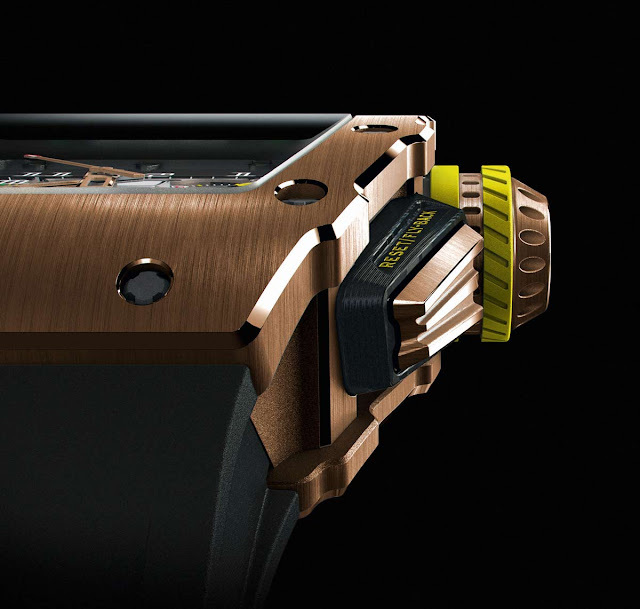 The three-part tonneau case (49.94 mm x 44.50 mm x 16.15 mm) of the RM11-03 Automatic Flyback Chronograph has been reworked by the designers to lend it an even sportier character. The model will be officially unveiled on September the 4th at the 3rd edition of Chantilly Arts & Elegance Richard Mille. Price to be announced.